Within our Hospitality department we offer bespoke opportunities tailor made to suit your company requirements (including a designated co-ordinator) right through to simply hiring a room for your event. The Cheshire specialises in coordinating and hosting large corporate events which can include sporting competitions, fun team-building activities or entertainment. 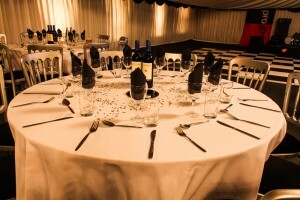 Whatever your needs we have ample facilities, parking and services that can help you plan a very bespoke or traditional corporate event. We are able to offer many facilities for your corporate/meeting use ranging from a simple meeting room, Sports Hall, County Lounge and Clubhouse. Whatever your use we have the room for you here at The Cheshire. If you are booking a meeting/corporate event with us then why not let us take care of your catering needs? Not only can we provide good quality and excellent value hot and cold food options, but we have been working with a host of professional outside caterers for many years that will help to provide any special requirements you may have. We are currently producing a corporate/meetings promotional offer pack that will be available here soon! In the mean time please ask to speak to a member of our management team for more information. Our meeting room is large enough to seat 50 people for a training session or 70 for a seminar, however this room is also comfortable enough to be used for smaller events such as team meetings or interviews. There are a variety of room layouts to suit your use. This room comes with many features such as a large Digital screen (to connect to your laptop), TV, White board, flip chart etc. We can cater for you, your team, your private function or your corporate meeting.